We spent a lovely morning over the weekend fruit picking. The sun was shining low in the sky, the first hint of Autumn in the chill in the air and the pumpkin patches stretching for miles, dotted with baby Pumpkins that will spend the next 6 weeks getting fat for Halloween. 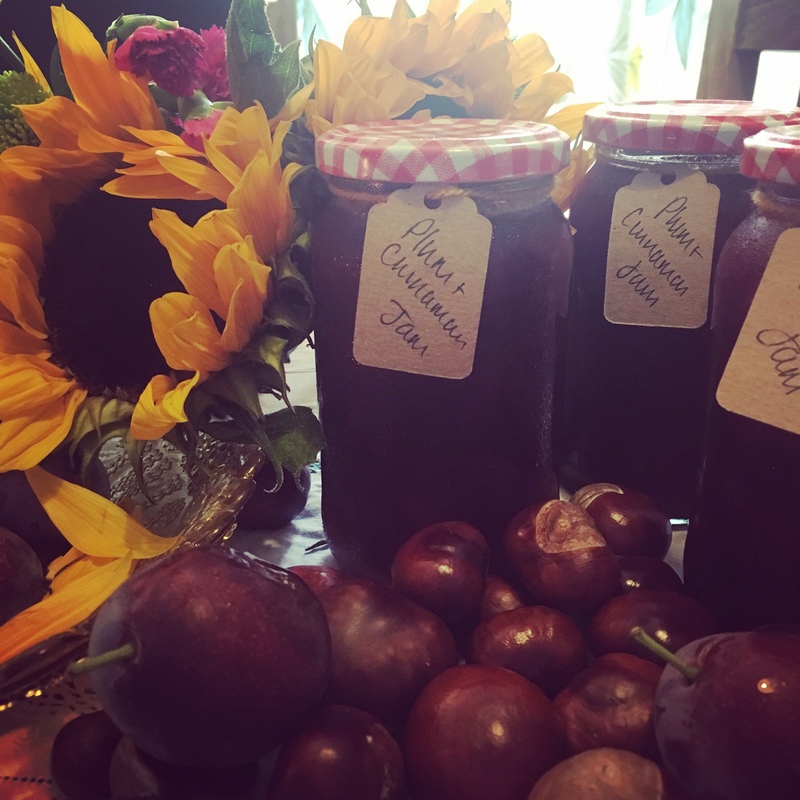 We came away with a bountiful haul of plums, damsons and strawberries and in keeping with the traditional seasonal shift, we decided to make jam. I am ashamed to say, I burnt the first batch of Damson Jam – and oh what a crime that was! The Damsons were incredibly tasty and I was sure would have made the most magnificent jam. They were also very difficult to stone and it felt like such a wasted enterprise. My error I believe was not taking my time when adding the sugar. This resulted in burnt Damson Jam. We made up a jar up anyway, as I was a little intrigued by the sweet, burnt taste, in the same way I adore really peaty single malt whisky. I do love the taste of bonfire. For my next batch of Plum and Cinnamon Jam, I took the jam off the heat and very slowly over the course of about 15 minutes stirred the sugar in bit by bit to ensure it had fully dissolved before turning the heat back up. I also halved the recommended amount of sugar in the recipe I was kind of following, and I am happy to report the jam tastes wonderful and it set beautifully. I did use a cooking thermometer to make sure I got the magic 105 degrees! Sterilise the jars and any other equipment before you start. I sterilised mine on a super hot cycle in my dishwasher (70) don’t forget to sterilise any equipment that will come into contact with the Jam like a ladle when filling the jars. Put a couple of saucers in the freezer, as you’ll need these for testing whether the jam is ready later (or use a sugar thermometer) I did both methods just to make sure I had it right. Put the plums in a wide mouth pan and add 200ml water. Bring to a simmer, and cook for about 10 mins until the plums are tender but not falling apart. Add the sugar, ground cinnamon and then let the sugar dissolve slowly, without boiling. This will take about 15 minutes and I took my pot off any heat whilst this happened. Increase the heat and bring the jam to a full rolling boil. After about 5 mins, spoon a little jam onto a cold saucer. Wait a few seconds, then push the jam with your fingertip. If it wrinkles, the jam is ready. If not, cook for a few mins more and test again, with another cold saucer. If you have a sugar thermometer, it will read 105C when ready. Take the jam off the heat and add knob of butter to disperse any scum. I filled my jam jars immediately. I was using metal screw top jars and if you fill them to the top and seal when the jam cools down they will create a handy ‘seal’ to keep your jam preserved for up to 6 months in the fridge.